Go into any grocery store, gas station, convenience store and you’re going to find packs and packs of chewing gum. What used to be considered a candy, has now become a health food (of sorts) as gum makers have recently moved to create gum that’s healthy for your teeth and won’t cause health issues. Well my prepper friend, I’m writing this blog post today because I want you to consider adding chewing gum to your survival kit. While chewing gum isn’t on the same level as a water filter or a camping stove, I think you’ll find keeping some of this stored in your survival kit or bug out bag can be pretty worthwhile. While this isn’t exactly attributed to the chewy, rubbery texture of gum, the good news is you can use the wrapper to start a fire. All you need is a wrapper that’s got some of that metallic, glossy material on it and a AA battery and voila, a gum wrapper lighter. This is where the MacGyver side of gum use comes out. The nice thing about gum is its consistency lends itself to being moth pliable and sticky, which is great in case you need to fix something that can’t be fixed with other tools. So what exactly can you fix with gum? Remember, for the most part these are temporary fixes, but in a pinch gum can help you out in a quick workaround. One of the best reasons to keep gum in your survival kit is because it’s great for helping to keep teeth clean. Gum manufacturers have recently been including (and excluding) certain ingredients to help promote better oral health. By chewing the gum, these ingredients can actually keep the bacteria responsible for gum disease at bay. Of course this isn’t a replacement for brushing your teeth, but if you’re on the go and want a lightweight option for dental health gum’s a great addition. The best gums to add to your bug out bag or survival kit for this purpose are going to be absent added sugar, will contain sweeteners like xylitol, and should contain some kind of peppermint or spearmint oil. Bear in mind not all fish are going to go for gum, but there are certain ones that will. Some of the fish that like going after gum are catfish, and minnows, although people report they’re able to catch other fish with gum. True, catching minnows won’t keep you fed, but you can use those minnows as bait for larger fish, so the use of gum in fishing is no less effective. It’s recommended you use gum with some sugar and some color to make this work. Please keep this in mind. The use of gum as fish bait is a survival use only. Many fish won’t be able to digest the gum and if they ingest the gum it could kill them. Only use gum in an emergency situation. 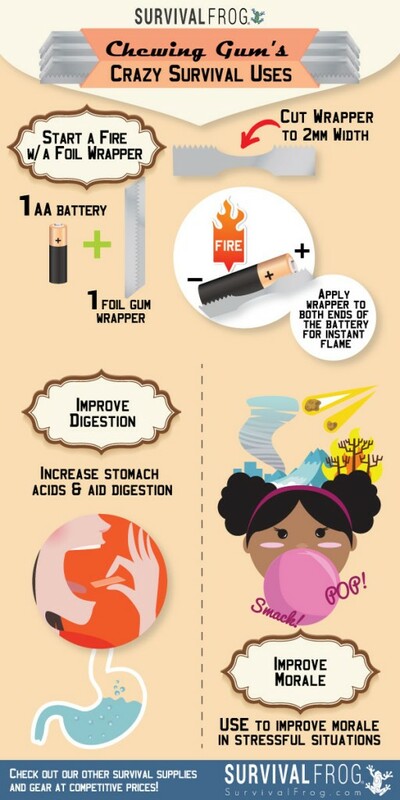 Our friends at Happy Preppers wrote this about how gum can help out with digestion and nausea. Gum aids digestion, and relieves nausea. ordinary to aid in digestion by relieving nausea. symptoms related to morning sickness. If SHTF you can rest assure the level of stress you’re going to be subjected to will be intense. Cortisol is one of your body’s main stress hormones, and anything you can do to keep it from spiking beyond its normal level is going to help you deal with stress better. Not only does it help with stress relief it can also help you stay mentally alert and focused in a time of crisis, that’s why the military began including it in soldiers rations some 70 years ago. If you want gum that really takes care of mental alertness you can opt to get caffeinated gums that contain 50 – 100mg of caffeine per serving. These kinds of gum will help keep you alert and energized in a time of crisis. One aspect of crisis survival situations people don’t think much about is how morale will suffer when daily life is suddenly altered for the worse. The simple act of chewing gum with a great taste can help make it feel like things aren’t as bad as they are. You can also give gum to others who are struggling with their new circumstances as a way of helping them readjust. The pleasantry of chewing gum will help bring them back to reality, but with a bit of grace. Believe it or not gum is actually a great tool to barter with. As mentioned in point number 7, people want things to seem like they’re normal. There have been multiple studies that conclude chewing gum is helpful at reducing cravings and curbing appetite; this is one of the reasons the military provides gum to soldiers. The good news is there are a few kinds of gum that work better at curbing appetite than normal gum. Yes, normal gum can help suppress appetite, but gums with natural additives like hoodia and caffeine have an even more pronounced affect on appetite suppression. Why does this matter in a survival situation? It’s simple really, the last thing you want to think about when the world around you is going to hell in a hand basket is how hungry you are. That’s a really good way to make an already difficult situation even worse. Now that you know all of chewing gum’s crazy survival uses you probably ought to know where to keep it. My suggestion is to keep several packs inside of your survival kit. Ultimately I recommend keeping it in a container that’s going to keep it safe from accidental exposure to moisture and the environment. 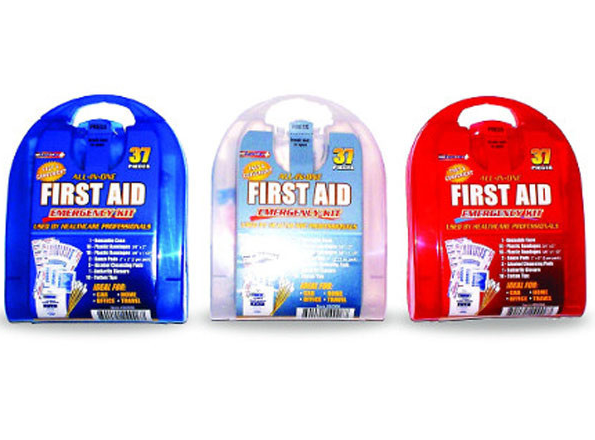 One of the best places is in your emergency first aid kit, that way it’s self-contained and safe. If you don’t already have an emergency first aid kit, or want to get another one, then click here or on the image below to get a great survival emergency first aid kit that will hold your gum safely. This entry was posted in Emergency Survival, SHTF, Survival Hacks and tagged chewing gum survival hacks, survival on January 20, 2016 by Survival Frog.